I met Jerry on Washington Street at Downtown Crossing. 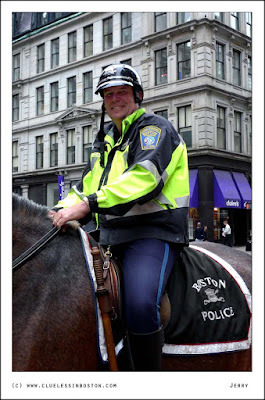 As you can see he is a mounted police officer, a member of the Boston Police Special Operations Unit. Jerry patrols the Downtown Crossing and the Back Bay Fens (commonly called "The Fens") area of Boston. The Fens is where the Red Sox play baseball at Fenway Park, and the Museum of Fine Arts is located. Cops smile and pose for pictures in Boston? a very happy chap! I also like your monochrome symphony photo. Superb! In every of your portraits, people are smiling; So I guess they like the fact that you photograph them. I wonder what they think about your project, (do you explain the whole thing ? ), do they ask you your blog adress to visit it and see their pictures?..Is noone afraid or distrustful?.. If you go on that way, I think you'll be able to publish a beautyful and interesting book about people of Boston! I find this photo fantastic because first the police officer is smiling and second because here the general population "hates" the police (which I really regret). Bravo ! And a big thank you for your comment on my blog. I feel very frustrated with my current camera. This is really an amazing portrait. You can see so much in his face. Yes, he's smiling. But he's definitely a complex character. You captured something indefinable but essential about him in this photograph. What "magical word"did you say to him? He looks cool and friendly! Congratulations!I think you are soooo kind and he couldn't say no for posing for this shot! Hi Jerry, pleased to meet you! Clueless, we can't stop you now that you've started! Great shot! Looks like he's enjoying his job! Nice shot! Honestly, I used to like police until I moved to Boston. Boston cops are the worst. That is a nice area to patrol!!! Nice portrait...I think mounted police can be quite effective. Seems to be a friendly sort.